The Summer (really, its the 3rd Quarter 2017) newsletter is now ready for your reading pleasure. The Spring 2017 newsletter is now ready for your reading pleasure. This weekend (July 8th), we have a day trip to Waco. Here is the link to our maps for the trip and some ideas for our time in Waco. The trip is pretty direct but much nicer/relaxing than driving the Interstates down to Waco and is geared toward a family-friend outing in a near city. Raymond Mimick will be leading the tour this Saturday. There is plenty of room for additional cars on the tour but the reservations are currently full for the restaurant. 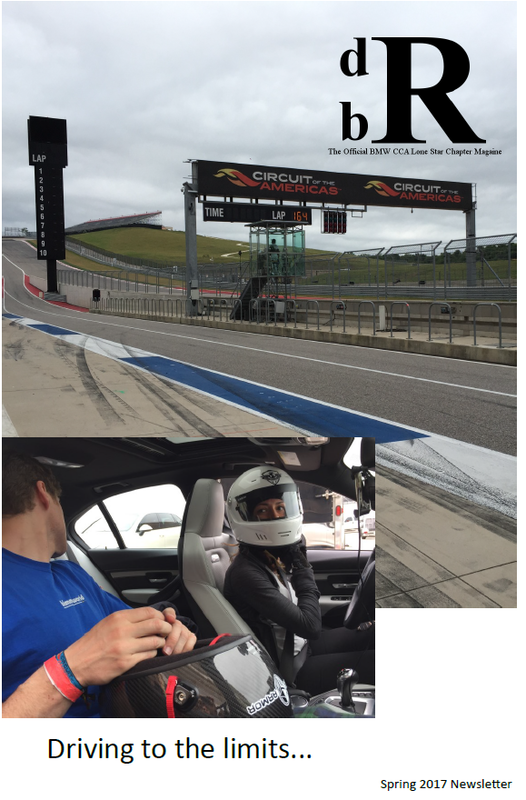 Our circuitous tour is 170 miles of beautiful north Texas roads with a planned “nature break” in Hico. We’ll arrive in Bluffdale at 5:30 pm for our 6:00 pm seating at Let’s Eat Cafe. Curren Dodd is the proprietor and is a classically trained chef. Maps can be found here. Regarding rain situations: Knowing most of us had an adventure in the rain on our trip down to Fredericksburg, we’ll keep an eye on it but if we see flash flood warnings, we’ll probably meet at the Circle K in Benbrook/Ft Worth (8000 Winscott Rd, Fort Worth, TX 76126) at 4:15p for an hour’s drive down to Bluffdale via 377. Watch your emails and Facebook for any update on that one. 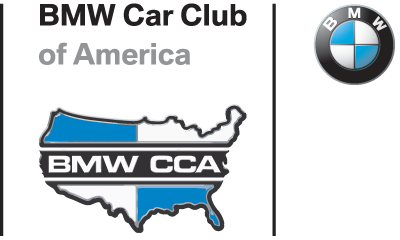 The BMW CCA Oktoberfest dates have moved from July 11th-July16th to October 31st – Nov 4th. The registration deadlines will be changed to reflect the new dates. Visit http://ofest.bmwcca.org/ to register for a great week in New Orleans. 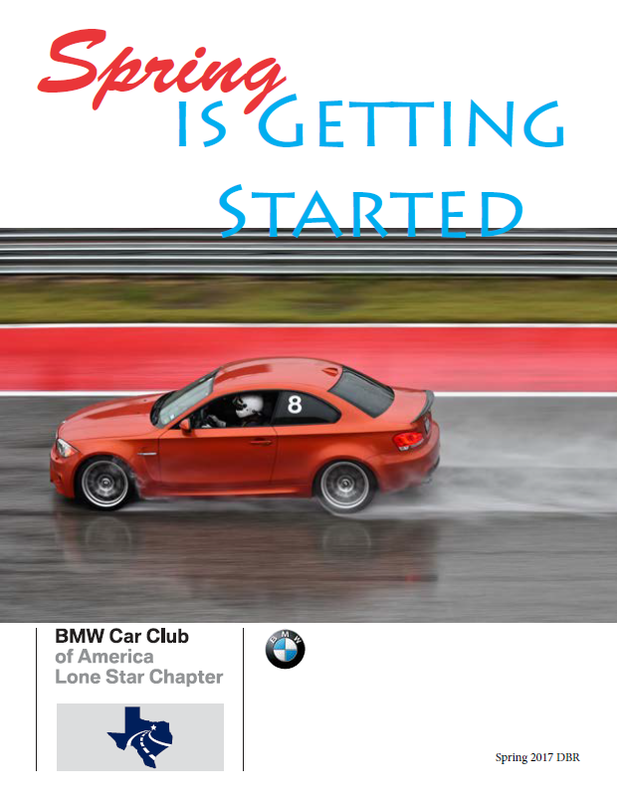 Attention people, The Lone Star Chapter is doing a VERY SPECIAL offer for the Spring HPDE at Motorsport Ranch in Cresson THIS WEEKEND. This will be a TWO DAY only offer! 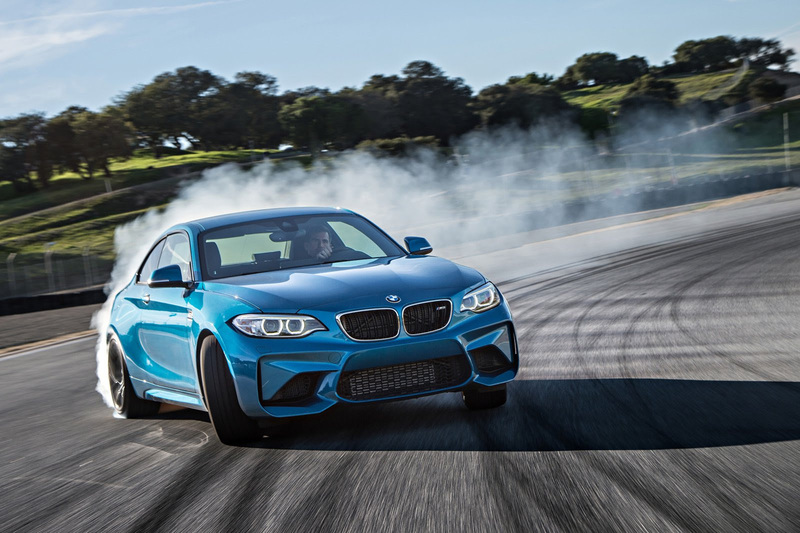 Anyone who signs up for the Saturday HPDE can bring another person to drive in any run group for $50! Yes you read that correctly. The first person pays the regular price and once he/she has paid, he/she will be given a special code to have one person he invites to have a $50 entry fee. This will only apply from Tuesday May 2nd starting at 8:00 am through Wednesday May 3rd at midnight. Don’t miss out on this offer! 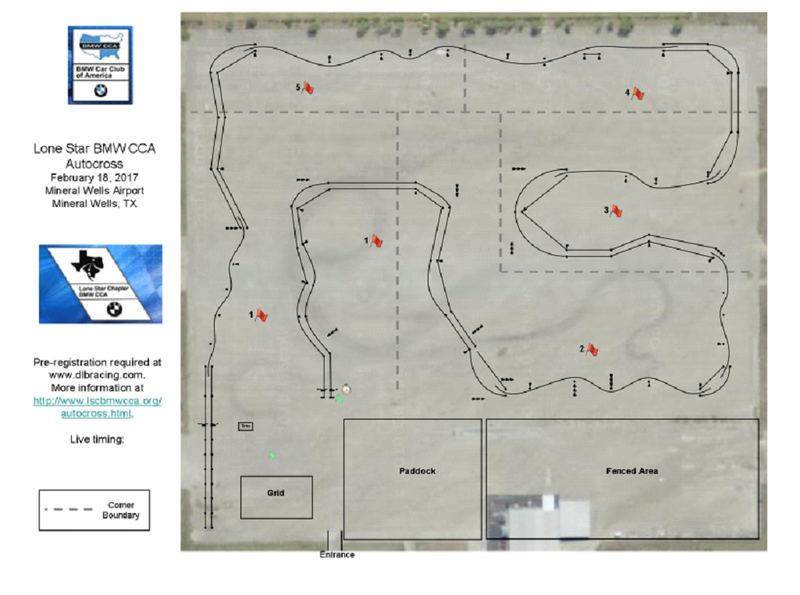 Saturday is not far away, and thus our #4 autocross event with the above course map. If we get more drivers closer to the event we may be able to upgrade the course, but it’s a little to early to be able to tell at the moment. The weather forecast is favorable with sunshine, but with a high of only 68 degrees. Note that we do not plan to serve hot dogs this time. Online registration is available until 6PM the Friday before the event. Cost is $30. We will also accept credit card payment on site, if maximum capacity has NOT been reached. The total cost for on site payment is $40. All participant vehicles must pass Tech Inspection on site. It begins at 8:00 am and will close at 9:00 am. You need to attend this meeting if this is your first time out with our club. Novice meeting starts at 8:30 and is followed by a course walk. All participants are required to work during runs when they are not driving. The assignments will be posted on the club van before the meetings. Mandatory Driver’s Meeting at 9:10 am. First car planned to start at 9:30 am. We will have 5 runs in the morning and 5 runs in the afternoon. 10 total runs per driver if the schedule allows! After the morning runs we will take an hour lunch break. Time for our second event and to encourage our Novice class to keep competing, the autocross committee have made the decision to offer 2017 trophies for the top 6 in the Novice class. Note that the participation in at least 5 events apply to receive a trophy. Come out and enjoy this course and the fellowship amongst drivers. We plan to serve hot dogs, as long as the weather allows for us to do so. After the morning runs we will take a 45 minute lunch break, during which time we will provide grilled hot dogs (weather permitting). Along with a smooth course we also have a forecast that is looking great for the weekend. Come out and enjoy the fun course and the camaraderie. We plan to serve hot dogs, as long as the forecast holds true, and hand out awards to drivers that have not received theirs yet. If you are not able to make this one, our next event will be on 3/18 at MW as well. 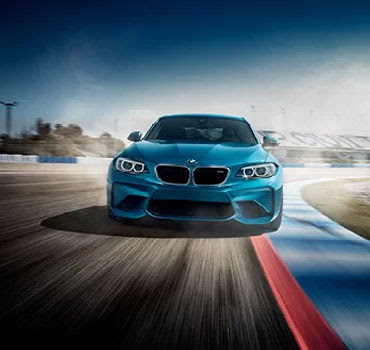 BMW Manufacturing to Host 8th Annual Supplier Diversity Conference. Site maintained by - Lone Star BMW CCA. For information regarding this site please contact the webmaster.